Home > Resource Center > How Many Koi Can I Have? This seemingly simple question is actually very complicated. Based on size and design, each ecosystem must have its own distinct fish load, water flow rates, oxygen levels, filtration system, the number of aquatic plants, the types of plants involved, feeding schedules, food types, the frequency of water changes and ratios ... and the list goes on. We generally offer two rules of thumb regarding the number of koi in a pond. First, average water conditions will allow 1 inch of fish per 10 gallons of water (or 100 inches for a 1,000-gallon pond). 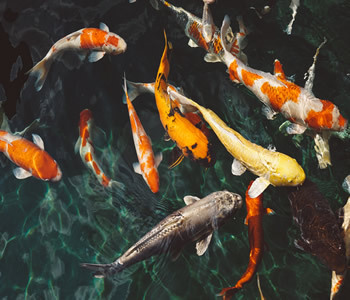 Second, due to pheromones and toxin control, we want to stay at or under four koi per 1,000 gallons of water to promote a healthy living environment. These recommendations are a starting point and would be the all-encompassing answer to the question if it were a simple question. But since we love our koi, we need to have a deeper consideration for their needs to secure their healthy ecosystem. This is why one of the first conversations between the owner and professional must focus on the end desire and how many koi the pond owner would like to have. This conversation must happen before you start the design so that the future koi and the pond owner will have the environment they need to maximize their potential - and the enjoyment of your work. I have too many customers with small water gardens that start the fish-load conversation with comments like, "I wish the pond were bigger." As it turns out, these customers' expectations of their pond are usually never met, because they want more fish than their pond was built to handle. To truly provide these types of customers with years of pleasure at their pond, you must not limit their numbers of fish by building too small or using inferior equipment systems. Koi need space to grow, swim, exercise and explore. We not only want to look at pond square footage, but also consider water depth, as this will control the temperature during hot summer months. The total volume is also key, because as we increase the mass of water, we create a safer buffer to disperse toxins and nitrates, minimize rapid temperature changes in the pond and give the koi more space to cruise around and build muscle. I personally do not like seeing koi in ponds smaller than 2,000 gallons, because we really cannot provide both the depth and the horizontal space they need to be healthy when they grow into adults larger than 20 inches. This is not to say that you cannot create a very healthy ecosystem for a few koi in a 2,000-gallon pond with proper water flow, filtration and aeration -you absolutely can. Water flow and aeration accomplish the same main goal - keeping the water cool and rich in oxygen. With more oxygen in the water, the ecosystem will be healthier. The fish can swim and breathe more easily, and beneficial bacteria like Nitrosomonas and Nitrobacter can reproduce and convert toxins. By rule of thumb, we like to circulate koi ponds once an hour. However, we can increase oxygen levels and create a healthier ecosystem if we increase the flow or add an aerator to the pond, thereby increasing the capacity of fish the pond can handle safely. Your aerator is a supplement, but it should not be overlooked, especially in deeper ponds that need circulation on the bottom. Air pumps are easy to install quickly and can instantly increase a pond's fish-load capacity, in turn fostering a very healthy ecosystem. Your filter choice is the backbone of the koi pond ecosystem. The filter serves as a breeding ground and housing area for beneficial bacteria to do their magic, so the larger or more efficient your filter, the better job the bacteria is going to do with filtering. 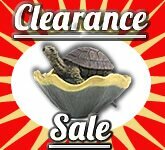 Oversizing the filter for your pond can permit a higher fish load, because a larger filter system can handle more fish. Along with size, we also consider function. Filters that backflush frequently are getting cleaned more often and thus are ready for more action. These filters are preferred over filters you clean monthly or quarterly, because biowaste is removed more quickly. Avoid installing filters that are hard to clean, like putting rocks and filter pads inside a waterfall box, for example. Customers need to be able to clean the filter at least monthly, so you have to make it easy for them. Another piece of filtration that needs to be installed is a properly sized UV clarifier. With the ultraviolet light's ability to drastically reduce algae reproduction, the filter is inherently more efficient in breaking down fish waste and avoids getting filled with algae. Yet another filter option is adding plants. A bog filter that incorporates plants and a gravel bed in the filtration process will provide nitrate control and added oxygen through aquatic photosynthesis. The presence of plants is greatly encouraged in all ponds as a supplemental filtering agent and ecosystem protector. Waterlilies provide shade, which cools the water table, while large-root bog plants such as iris, reeds and cannas provide constant toxin reduction. Possibly most important are oxygenating plants like Anacharis and Cabomba that can stabilize the water table and absorb enormous amounts of nitrates while providing high amounts of oxygen back into the water throughout the day. One bog plant or oxygenating plant per 10 square feet of surface area and up to 50 percent waterlily coverage is ideal. These are easy to add to the pond and will make a huge impact on both the ecosystem and the visual softness, which your client will definitely notice. Fish load is truly all about water quality, which is good news, because you have control of water quality as you design. The pump, filter and aeration systems are key, but you cannot stop there. Install skimmers and bottom drains to increase the quality and purity of the water table. If we allow sludge to build on the pond floor, we lose some of that quality. Designing the pond so that all the fish waste exits quickly, gets trapped in the filter and then is released weekly will greatly improve the water quality and thereby increase the fish-load capacity for your customer. Knowing that koi lovers will always want more koi, it is of greatest importance to build a pond with the proper equipment that will allow the owner to extend the fish load as desired. Ideally, the pond's maximum fish load should always be greater than the number of fish the client has or wants at the moment. In the end, you determine how many koi your client can have with your design and build. You are the professional, and the client needs your expertise in the design as well as your advice regarding maintenance and water quality. You above all others can explain the system's strengths and limitations. For the pond owner's future enjoyment, make sure to explain the importance of weekly backflushing and partial water changes. Also help them with food choice and the proper way to stock their pond a little at a time. So maybe the question doesn't have an exact answer, but you have control of the answer. Position your client for success by building a koi pond rather than a water garden, and use the equipment their koi family members deserve. They will thank you for years to come for your attention to detail and shared passion.